The Czech ArcticDefinitions of the Arctic vary according to environmental, geographical, political, cultural and scientific perspectives. Some scientists define the Arctic as areas having a high latitude, long winters, short, cool summers,... More Research infrastructure on Svalbard, Josef Svoboda Station, is owned by the University of South Bohemia in Ceske Budejovice, Czech Republic. The Josef Svoboda Station consists of three components: 1) Julius Payer House (link) in Longyearbyen, the capital city of Svalbard; 2) Field camp Nostoc (link) in Petuniabukta in central Svalbard; and 3) motor/sail yacht RV Clione, a research vessel that can be operated around the Svalbard archipelago. Julius Payer House is located in the center of Longyearbyen. It provides easy access to many areas around Adventfojrden as well as serves as a hub for further explorations of Svalbard via boats or snowmobiles. 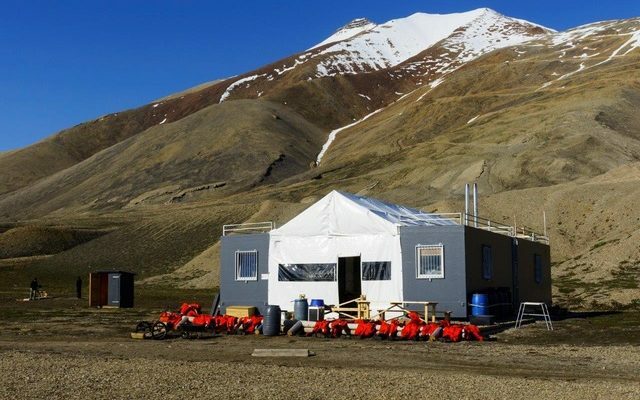 Nostoc field camp is located in central Spitsbergen, near an old Russian mining town Pyramiden in Petuniabukta in northern part of Billefjorden. The station is situated a short distance from the shore-line of the fjord and is flanked by mountains reaching altitudes up to 1000 m a.s.l. Three national parks are located in close vicinity of the station, i.e. Sassen-Bunsow Land, NordeIsfjorden, and Indre Wijdefjorden. The nearest settlement is Longyearbyen, located 60 km to the south. The station is located in the High Arctic climateThe average weather we would expect over a long period of time (seasons, years, decades). Climate varies from place-to-place across the Earth. Climate is determined by long-term (over at least... More zone in the central part of Spitsbergen, which is more continental and drier than the western part of the archipelago. The station lies in a coastal zone neighboured by steep mountains with a high altitudinal gradient. Various habitats can be accessed within walking distance of the station, i.e. sandy beaches, waterlogged tundraA type of ecosystem in which tree growth is limited by low temperatures. The origin of the word is from from the Kildin Sami word tūndâr, meaning "uplands" or "treeless mountain tract". In the northern... More, seepages, dry tundra, bird cliff s, small lakes, glacierA glacier is a large, persistent body of land-based ice that forms over many years where the accumulation of snow is greater than its loss (ablation). The ice in a... More rivers, and glaciers. The area is rich in wildlife including gulls, kittiwakes, terns, barnacle geese, eider, reindeer, Arctic foxes, and polar bears. Czechoslovakian scientists have conducted research on Spitsbergen since the early 1980’s, especially in the south-western and central part near the Russian mining towns Barentsburg and Pyramiden. First station Petuniabukta was established in 2007, when two containers (one for storage and one for living) were installed on a landing wharf in Pyramiden. During the summer season, a Russian hunting hut (built in 1980s), located c. 6 km north of Pyramiden, is used for research activities in the area. The hut was rented from the Russian mining company Arktikugol and has been used by our research group from 2008-2015. Communication with field camp Nostoc and RV Clione is possible via satellite phones and VHF radios. Julius Payer House has high-speed wifi and mobile coverage. Research is focused on biodiversity and ecosystemAll the living organisms (including people) in an area as well as its physical environment, functioning together as a unit. An ecosystem is made up of plants, animals, microorganisms, soil,... More dynamics. Investigations of plant ecologyThe study of living organisms in their environment, including where they are found and how they interact with their physical environment and with each other, for example through food webs.... More, phycology, parasitology, and bioclimatology have a relatively long research history in the area, while new scientific fields such as geomorphology or hydrologyThe study of water in the environment, particularly its amount, movement and quality. It encompasses water in rivers, lakes, glaciers, soil and underground aquifers. The way in which water (liquid and... More emerged more recently. Meteorological monitoring was established at the station in 2007. A recent pilot project of a Czech research group is focusing on biological and climatic diversity, including ecological, phytological, zoological, and parasitological research. A second larger inter-disciplinary project focuses on glacier dynamics by gathering information from the fields of geologyThe study of the solid Earth, rocks and processes by which rocks form. 'Geo' is derived from the Greek word for Earth.... More, geomorphology, glaciologyThe study of glaciers., climatology, and hydrology. Julius Payer house is located in Longyearbyen, the central and largest settlement on Svalbard and home of the Norwegian administration. The town has overt 2000 inhabitants, and includes impressing infrastructure for such a small municipality, i.e. shops, airport, hospital, university, church, etc. Traditionally, the population was employed in fishery (whaling) and later in the coal mining industry. Tourism and university level education have become increasingly important economic factors for Svalbard within the last decades. The field station Nostoc is located approximately 60 km from Longyearbyen near an old mining town Pyramiden (ca 1 hour on foot). Pyramiden was abandoned in 1998 and now supports a population of c. 15 people in summer and eight people in the winter. It is a popular tourist destination and there is a hotel as well as a restaurant there. The field camp Nostoc can be reached using tourist ships that travel to Pyramiden daily (one way trip: 2-4 hours). The station is located 6 km from Pyramiden and can be reached either on foot or with a small boat (zodiac). Travel in the vicinity of Nostoc station is only possible on foot or with small boats. The field camp Nosto is usually only open during the summer season (late June-early September). RV Clione can be used to travel to remote areas of Svalbard (research permits need to be acquired in advance). It can take up to 10 researchers onboard for day trips and up 4 for overnight stays.